When buying a home it’s important to know what commonly used real estate terms mean, and more importantly, what they mean for you as a buyer. One of the key factors home buyers look at aside from price and location is the number of days a property has been on the market. Days on market start when the property is listed and end when an offer is received and the status is changed from ‘active’ to ‘pending’. The total days on market are calculated by taking the last 30 days to six months of sold listings, adding together the days on market (before each listing went pending) and dividing that total by the number of listings. A low number of days on market could mean that the property was only just listed or re-listed, that there is a smaller inventory of properties for sale in that area, or that the property is located in a high demand area where buyers are motivated to move quickly. Over the last three years in Colorado, the median number of days on the market has remained consistently around 65. This is typical of other high demand areas as well; San Francisco and Chicago have also seen properties sitting on the market for roughly 65 days prior to sale, whereas lower demand areas like Ohio and Kansas had homes on the market anywhere from 60-360 days or more. A high number of days on the market can correlate to a handful of things, but the usual reason a property will remain on the market for an extended period of time is over-pricing. Over-pricing is incredibly common in the real estate world where it’s understandably hard for a seller to put a material value on their home, something which to them, can be considered priceless. If a property is priced correctly and still on the market after a long period of time you may want to ask yourself if something could be wrong with it. If this is the case, it’s important to find out as soon as possible before you lock yourself into a contract. Finally, it’s also possible that there is an entirely innocent reason the property is still on the market. Maybe the owner just isn’t that motivated to sell, or there is a tenant living there currently which makes scheduling showings difficult. Whatever the reason, if the home you’re interested in has been on the market for longer than the average amount of time in your area, it’s important to do the full research to find out why- who knows, you may even be able to negotiate a lower price! Are Professional Real Estate Photos Worth The Hassle And Expense? Today’s Blog Post is brought to you by Catherine Burgess. Below Catherine shares insights on how professional photos can greatly improve home sales and entice buyers. Friends, how many seconds do you spend looking at the initial photo on your favorite real estate website? Time it and see. 5 seconds? Maybe 10? In today’s digital age, seconds are all you can expect. If your real estate agent doesn’t bring the best possible photos to the launch of your media campaign, how is your sale impacted? Compare these three photos. The client wanted their property on the market as soon as possible, not wanting to wait for professional photos. So, the initial non-professional photos went up; four days later the professional set was loaded. After 4 more days, the virtually-staged photos were completed and uploaded into the MLS and marketing data. Sellers, when thinking through timing, it is important to keep in mind who the most serious buyers are and when they come to the market place. During the first week after listing: qualified buyers who have been working with an agent will see your property, if it overlaps with their search criteria. They’ve been waiting for the right property and are poised to make an offer. During the second and third weeks on market more causal buyers will see the listing. They may not be monitoring listings every day, but are loosely keeping track of potential homes. Beyond the third week, we get into a combination of people just coming to the market and hobbyists. So. Is it worth bringing your photographic A game to your starting day? You bet. You have one chance to make a superlative impression on buyers. Wait one week to put your property on the market, if that means that you could attract (or not repel) more buyers through the use of professional photos. Staged properties sell more quickly and for more money than non-staged or empty homes. (Virtual staging, as in our third picture, is a digital low cost alternative to give buyers a feeling for how space can be used. It is a viable option for lower-priced, vacant properties.) Read through our blog Set The Stage For A Quick Home Sale to understand if staging is something you should consider. The leaves are changing and there’s a chill in the air – what a beautiful time to live in Colorado! Fall is a great time to take care of your home and keep it looking great as the seasons change. If you are selling your home, it’s especially important to keep working on the curb appeal. – Rake and remove dead leaves as often as possible, especially sweep porches and walkways. – As leaves and debris build up, it is VERY important to clean your gutters and downspouts frequently, so once the snow starts flying, the gutters are clean and ready to do their job. – Remove weeds and trim back dying plants from your flowerpots, lawn and garden. – Bring in pots of heartier flowers like chrystanthemums or place some pumpkins or other fall items around your front porch area and keep them neat – remember simple is better. Also, store empty flowerpots in your garage or shed. – Have your sprinkler lines blown out and winterized before the first freeze – no one wants to deal with broken pipes! – Be sure to aerate your lawn and fertilize before the ground freezes. Consider planting some bulbs for the coming spring. – Have your furnace serviced by a HVAC professional, and purchase extra filters to get you through the winter months. – Check all windows and doors, and add caulk or weather stripping to seal any areas as needed. – Take some time to check all exterior light bulbs. – Cover or store patio and lawn furniture. – Change out your lighter window coverings, throw pillows, and other accessories for warmer seasonal ones (again – think ‘simple’). – This is also a great time to change the batteries in your smoke and carbon monoxide detectors. Taking care of these items now will keep your house in great showing condition, and ensure that you won’t be worrying about your home once the snow starts flying. Colorado Landmark is on Pinterest! Did you know that Colorado Landmark is on Pinterest? We love all things real estate. So what better way to share tips and tricks, or photos of the places we love in Colorado , or simply Amazing Estates. Even if you are just looking a little style inspiration, we’ve got you covered! Stop on by and tell us what you would like to see on our Pinterest. We look forward to hearing from you! If you live in the City of Boulder, you have probably heard at least something about the SmartRegs Program for residential rental property. “Prescriptive Pathway” Score of 100 points or more. All residential rental properties in the City of Boulder are required to be in compliance by January 2, 2019. Obtaining a HERS rating is a fairly costly and involved process, it can take several hours and the cost is usually in the range of $700 for a single family home. If you happen to already have a HERS rating for your property, great. If not, the Prescriptive Pathway system may be a more suitable option. The Prescriptive Pathway system is intended to be a more simple and less costly energy audit. For $120 you can have an Initial SmartRegs Inspection done on your property (must be through an approved inspector, call 303-544-1000 to schedule). This inspection will help you determine what energy improvements (if any) you will need to make by the deadline in order to increase your property’s score. Points are earned d on items such as: Attic and Wall Insulation, Windows, Air Infiltration/Duct Leakage, Floors/Foundations, Heating/Cooling/Hot Water, Lighting, Refrigeration, Solar Power, Occupant Behavior, and Water Conservation. Categories are weighted differently, so be sure to have a clear picture from the inspector about what the smartest improvements would be. There are some great incentives to get your City rental property in compliance NOW. Rebates are being offered by Xcel Energy (20% of the project cost, up to $300) and the Energy Smart Program (Up to 50% of the project cost, up to $500 – this incentive ends May of 2013). You are required to use an approved contractor for this work. Once you have completed the work and achieved the correct score, complete the SmartRegs Energy Efficiency Application through the City of Boulder and you will be awarded a Proof of Compliance Certificate. You only need to do this once and it does transfer with the property. ** Note: You do NOT have to have a rental property or live in the City to have the $120 EnergySmart inspection done – anyone in Boulder County can do it. This is a great opportunity to find out how you can make your home more energy efficient! 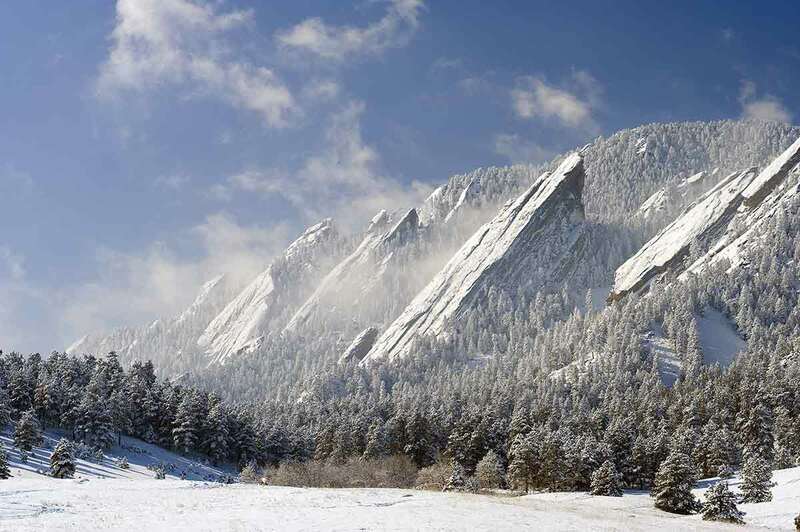 Prepare your home for winter in Boulder! Winter is on its way here in Boulder, evidenced this week with our first big snowstorm! No doubt you have been cleaning up leaves and maybe some broken branches. This time of year is beautiful and there is always something going on around town – school events, sports activities, CU Buffs games, and Halloween to name a few things. Don’t get so busy with the fall fun that you forget stay on top of a few important home maintenance “to do’s” to make sure your house is ready for another Colorado winter. Trim trees and remove dead branches. Bad weather and the high winds we sometimes experience here in the Boulder area can cause weak limbs to break, damaging property or causing injury. Consult a professional tree service for large jobs. Reduce energy costs by lowering the thermostat on your hot water heater to 120 degrees F.
Make sure caulking around windows and doors is adequate to reduce heat loss. Replace the filter on your furnace and schedule routine maintenance with a qualified heating contractor. Change the batteries in your smoke and carbon monoxide detectors – time this to correspond with switching your clocks back in the fall, and then forward in the spring so you won’t forget! Clear out gutters and downspouts on the exterior of your home to prevent the build-up of leaves and debris that can impede the flow of rainwater and cause water damage. Check your chimney for birds nests or other debris especially if you have a wood burning fireplace, and make sure the chimney cap is in place. Call a chimney sweep to perform maintenance. Be aware that mice will try to start coming in from the cold, especially if you live in or near a rural area, field, park or open space. There are numerous ways to trap mice, humane or otherwise. You will find many choices and expert assistance at McGuckin Hardware, Boulder’s go-to place for pretty much everything since 1955. Consider repainting or staining and sealing your exterior doors to protect them from rain, snow, ice and wind. A $10 can of paint or sealant could go a long way to prevent damage to an expensive door. Cover your patio furniture, outdoor grill, portable firepit, etc… or move into storage. Drain and store your garden hoses, and have your sprinkler system blown out to prevent damage to pipes in freezing weather. Pull your refrigerator away from the wall and vacuum the condensor coils to prevent damage to the motor. Clean out your whole house humidifier and replace filters before heating season starts. Be prepared for weather related emergencies such as high winds, tornados, blizzards, or flooding. Organize survival kits and review an emergency escape or protection plan with your household. Have a wonderful fall and enjoy everything our beautiful area has to offer this season! Credit Scores – What it Means, Why it is what it is, How to Change it! It is a number between 350 and 850 that represents what tradeline organizations (credit cards, lines of credit, store accounts, lenders, etc ….) think your credit and transaction history represents. The higher the score, the less risk it will be for them to extend you further credit. “Perfect credit” right now would be a score of 740. The highest score Kevin has ever seen was an 823! Who are the Credit Reporting Agencies, and Who Uses their Info? There are 3 agencies that track your credit – Equifax, Transunion and Experian and each of them has a file on anyone who has ever been given credit. Each organization has their own secret formula for calculating your score. A mortgage lender will get an overall picture of your credit worthiness by pulling scores from all three agencies. How to have a GREAT Credit Score! Make all of your payments on time, and have a good payment history. Be aware though that if you have a late payment and are assessed a late fee, it is not necessarily reported to the credit bureaus. Have low balance ratios. Example: if the card limit is $1000, a low balance ratio would mean you owe 33% or less than that, or $333 or less on that card. Anything over a 65% balance ration will raise a red flag with your lender. Have a reasonable # of tradelines open – Kevin mentioned that FIVE is a good number. A mortgage, car loan, student loan, and 2 credit cards is an example of good combination. What Other Things Affect Your Credit Score? When you open up a new credit card account, your credit score could take about a 30 point hit initially, until a your payment and usage history can be determined. When your mortgage lender pulls your credit report you will NOT take a credit hit. 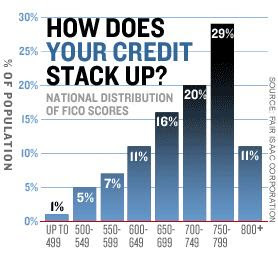 However if you start talking to several lenders and there are more than 3 credit report pulls in less than 2 weeks your score may be reduced by 10 points per pull. Usage on your debit card does NOT report to your credit score. If you are taken to collections on something, this will definitely have a negative effect on your score. If you are able to resolve the issues the creditor does have the ability to call the credit bureaus and have the item removed, you just have to convince them to do it! The more credit applications you make, the more hits your score will take. It usually takes 30-60 days for your credit score to be adjusted for these types of things.. If you have been involved in a foreclosure on a home mortgage your score likely take about a 200 point hit. As far as the lender is concerned, being 120 days or more late on your mortgage affects your credit the same as a foreclosure. Being involved in a short sale affects your score less – check with your lender or financial advisor about the specifics for you. If you are applying for a mortgage DON’T do anything until your loan closes that will affect your score, like buying a boat, applying for new credit cards, renting a summer home, etc… These are all things Kevin has seen clients do that ended up affecting their ability to close their loan and/or the rate they got! Why Worry About Your Credit Score? More and more orgagnizations we deal with on a regular basis are pulling our credit scores to get an idea of the kind of people we are – employers and prospective employers, insurance companies, car dealers, mortgage lenders, landlords, department stores, etc…. Did you know that a good credit score can make a difference in up to $100/month on insurance premiums? Your credit score will also determine the interest rate you get on your mortgage, which of course you want to be as low as possible! How Can You Establish Good Credit, and Help Your Kids Establish Credit NOT Debt? Get a secured credit card from a bank or credit union. Credit unions are especially great in working with young people. Ask the tradeline that you use if they report to the credit bureaus, and if they don’t, request that they do. Gas cards are easy to get. Put your child on one of your existing credit cards or lines of credit, but make sure the limit is low and they know that it is still your account! Their credit will get “credit” too for the usage. Stop applying for credit if you want to improve your score! Close accounts you do not use, but keep a minimum of 4 lines open even if you don’t use them. Don’t close the older more mature accounts as this history really helps you. You have several options here. You can go to each of the credit bureaus independently and get reports, or you can go to http://www.experian.com/ and order your Personal Three Bureau Credit Report and Score. There is a fee for this. To see your report only but not your score for free, go to http://www.annualcreditscore.com/ and get one report per year free. As a disclaimer we will say that we at Colorado Landmark are NOT credit experts. Please contact Kevin Teel or your preferred lender, or one of the 3 credit reporting agencies to verify statements made in this post, or to answer any questions you may have on this topic. Thank you Kevin for the great class! An open house is a great way to showcase your home, and an opportunity for many people to view your home at once. Curb Appeal is Key: The first thing a prospective buyer notices about a home is the front yard. Cut the grass, trim the hedges, rake those leaves, sweep the sidewalks, and power-wash the driveway. If appropriate for the season, include a few potted flowers to brighten up the entryway. De-Clutter: A cluttered room can appear too small to buyers. Go through each room and divide belongings into two piles: “keep” and “give up.” Items in the “keep” pile will be used to stage the room, while those in the “give up” pile should be stored elsewhere, or better yet given away. You are not selling your things or trying to impress anyone with them. You are selling your space and buyers can’t visualize themselves or their own things there when there is too much of your stuff in the room. Don’t forget about the outdoor spaces too – de-clutter potted plants, kids’ toys, gardening items, outdoor furniture and accessories, etc…as well. Make your place “Q-Tip clean.” A properly staged home should be immaculate, or “Q-Tip clean,” This could mean using Q-Tips to clean dead flies out of a windowsill or going around the bottom of the toilet on the floor. 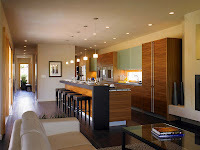 The purpose of an immaculate house is more than just making it presentable. If a home is messy or dirty, a buyer may wonder what else about this property hasn’t been cared for, like major and minor maintenance items. Check the temperature. In winter a warm home is always more inviting than one that has people reaching for their coats. On a hot summer day a cool home can be a welcome oasis to weary home buyers. In warmer weather have windows open for fresh air if it’s not hot outside. Light it up. Open blinds and window coverings, and turn on all the lights. This helps make the spaces feel bigger, and specially placed lighting can showcase special aspects of the home. It may also be appropriate to have fireplaces and candles lit to create a cozy environment. Say “Yes” to neighbors. Some sellers are against holding open houses as they can be a magnet for “nosy neighbors”. While this may be the case at times, your neighbors are also a great resource to help get your home sold. Make them feel welcome by letting them know ahead of time that the open house is scheduled, and invite them to come check it out. The more eyes that see your house, the better. For additional information and resources to help get your home sold quickly, feel free to contact us – we are here to help! Check out our 356 Things to do in Boulder Page! Freeze warning tonight – is your house ready? We wondered if it was going to happen – but finally, we are seeing some real Colorado winter weather. And with the beautiful snow that has been falling comes some FREEZING cold temperatures. Unfortunately, this can lead to frozen pipes and damage to your home. When the temperature drops, water freezes and expands. Water pipes do not expand causing broken pipes and possible flooding that can lead to hundreds or even thousands of dollars of damage. Set the thermostat in all areas no lower than 60 degrees. Open kitchen and bathroom cabinet doors to allow heat to get to uninsulated pipes under sinks and appliances near exterior walls. Turn on a trickle of water in any areas that you are concerned about, especially any faucets near outside walls. Let the warm water drip overnight. For future protection, considering adding insulation around pipes in your home’s crawl spaces and attic if possible. If you do suspect a frozen pipe, dont risk it -shut off the main water supply and call a plumber! Don’t Eliminate the Mortgage Interest Deduction, Employ Basic Supply-Demand Principles! With Shiela Mudd Roberts permission we are including here content from her blog post today about the current momentum in our legislature to eliminate the deduction for mortgage interest for homeowners. Shiela has some great insights … read on below or link to her blog for this article and other great local real estate information. “I have to admit, I heard blimps of this in the news over the past few months but it is so absurd that I didn’t think it would really happen. But then I saw a headline that read “National Association of Realtor’s Defend Mortgage Interest Deduction”. Well, absurd as it is, the current administration is trying to take the change right out of our pockets and, thankfully, NAR has already reacted. The way it currently works is that if you have a mortgage, you very likely have interest that you pay on said mortgage. Look at your statement, especially for the first say 15-20 years most of your monthly payment is interest. This interest paid is then deducted against your earned income come tax time. If you have rental property or second homes, same thing. What is being proposed is that this annual amount, totaling thousands of dollars, is no longer going to apply for a tax deduction. Things are unclear whether the proposal will protect your primary residence or not. Regardless, just like for home owners, mortgage interest deductions combined with depreciation, is a huge incentive for investors to own rental property.